Earth Sciences is a multi-disciplinary degree programme that is positioned at the interface between geography, geology, environmental science, chemistry and physics. It aims to develop a holistic view of how the Earth works by stepping beyond the boundaries of traditional subjects and integrating perspectives from many fields of study. It is centred on the concept of Earth System Science which views the planet as a complex system of interconnected parts and considers the flows of matter and energy operating within and between these components. The changes occurring within and among elements of the Earth system, along with the role that humans play as part of this process, are key topics of study. Are you concerned about climate and environmental change? Are you interested in getting to the heart of the science behind the media ‘spin’? Do you want to know how the Earth works, from the top of its atmosphere to the centre of its core? Are you seeking a qualification that will give you access to a broad range of careers? If the answers to these questions is yes, then Earth Sciences may well be for you. The Earth Sciences degree at Trinity provides the scientific basis for understanding many of the major challenges that society faces in the 21st century. The spectacular success of our species has been fuelled by our ability to harness Earth’s natural resources and manipulate them for our own purposes. With the number of people on the planet set to top 10 billion before the century is out, it is critical that we learn how to manage the Earth in a sustainable manner, whilst dealing with the legacy of our planetary tinkering. Rather than simply teaching about subjects such as global warming, sea level rise, extreme weather, environmental degradation, biodiversity loss and extinction, this course explores the underlying processes at work and provides the context necessary to identify and evaluate the effects of human activities. Why study Earth Sciences at Trinity? Earth Sciences is a direct entry programme for students who have a clear interest in studying how the world works using a multi-disciplinary approach. At Trinity you will learn from internationally renowned Earth Scientists whose expertise is woven into the fabric of the research-led teaching which characterises our degree programme. Traditional lectures are complemented by practical training in laboratory classes which provide hands-on experience employing a range of techniques and equipment. Fieldwork, including two overseas field courses, is an integral part of the programme, with further opportunities to work outside the classroom as part of your independent research project. This project will introduce you to the exciting world of scientific research and the process by which new knowledge is developed. Our final year students research topics that are drawn from across the full spectrum of Earth Science and have included: reconstructing environmental and climate change by analysing ancient vegetation, land surfaces and ocean temperatures around Ireland; probing African lakes to understand the frequency of volcanic eruptions and causes of vegetation change; analysing images from Martian landers and satellites to understand the physical process operating on another planet; hunting for economic trace metal deposits in discarded mine waste; and analysing the geochemistry of individual mineral grains to understand the plumbing of an active volcano. The Earth Sciences programme offers a tailored curriculum that balances the need to establish a broad foundation of knowledge with the opportunity to develop more advanced skills in selected areas of interest. The freshman years provide a grounding in the physical and geosciences with particular emphasis on physical geography, geology and human-environment interactions. In the third year, you will begin to deepen your knowledge in particular subject areas whilst developing a range of practical and technical skills. This year culminates with your selection of a specialist area of research that will form the focus of your final year project, and your participation in an overseas field course. In the fourth year, you will complete a significant piece of independent research on your chosen specialism (dissertation) as well as broadening your field experience during the final overseas field course. You will complete your studies by building your own programme, comprising advanced, research-led modules taught by staff in Geography and Geology. Modules outline can be seen in the Earth Sciences Handbook, download here (PDF 3MB). In an increasingly interconnected and complex world, employers are seeking graduates who can combine analytical rigour with an understanding of real-world problems that are not limited to a single discipline. The Earth Sciences programme produces flexible graduates with a broad skills base that are capable of responding to the needs of a rapidly changing employment market. There is currently a global shortage of geoscientists. Careers leading directly from Earth Sciences include work in: environmental, engineering and geological consultancies; mineral exploration companies; the oil industry; environmental planning; government geological surveys; teaching and research. Many of our graduates have gone on to work in research in Ireland and abroad. Others have chosen to further develop their skills in particular specialist areas such as petroleum exploration, hydrology, GIS and Earth Observation and have been admitted to a range of postgraduate taught programmes. 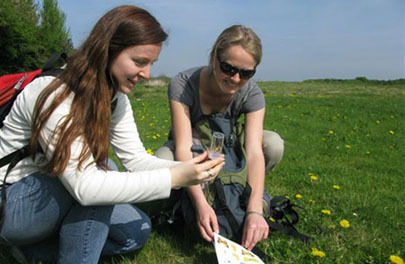 Further information on life after an Earth Sciences degree is available on our Facebook page.